Greg is involved in the development, commercialisation of novel and scientific technologies through his investment fund Matū. This fund invests in early stage innovative ideas suitable for disrupting large global markets. 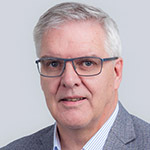 He has been actively involved in this area for the last 18 years having held a number of CEO and Senior Executive roles in large public multi-national companies both in NZ and internationally, and in partnership with the NZ Venture Investment Fund. In 2016, Greg co-founded Mekonos, a medical device company out of research from Canterbury University, that develops robotic tools to enables biomedical researchers to deliver macro molecules and biological components to cells with greater control and accuracy. Greg chairs the Boards of Objective Acuity, Humble Bee, Matū and Gresan Consulting, is a Director of Mekonos, Lanaco and Clean Planet, is a Committee Member on several Return on Science and Momentum Committee’s and the Technology Transfer Advisory Board of Canterbury University and is a Founding and Current Executive Council Member of the Angel Association of NZ.